The icon showing someone pulling the cart is inspired from a vision St George Preca had soon after he started SDC in Malta. A young lad pulling a cart full of agricultural manure asked George to help him push the cart. St George believed that young boy was Jesus himself who wanted him to help out in spreading the Word through catechesis. He also said he felt SDC members were with him in that vision. SDC members therefore are people who also want to get involved in pulling the cart along and joining in working to spread the gospel of Jesus. S.D.C. is a Catholic Society that works in the field of Catechesis and the spreading of the Word of God in different ways. This website gives some information about our Society, its activities and its founder. We also aim to provide catechists and teachers with free resources that can be used in different situations to help passing on the faith to others. You are welcome to this site, to make use of our resources and learn more about S.D.C. and its work. SDC was founded by St George Preca in Malta in 1907 soon after his ordination to the priesthood. Following a few informal meetings Fr George had with a group of young people in the town of Hamrun in Malta, the first catechism centre was opened on 7th March 1907. Notwithstanding some serious difficulties that often come about when working in the field of the Lord, SDC flourished and spread in many parishes across the Maltese islands. Its aim as outlined by its fonder was to train competent lay catechists who would be able to teach and pass the word of God to others. 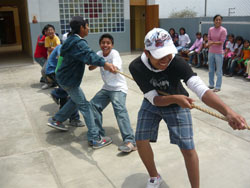 Fun activities for the young people who attend the SDC Centre in Lurin, Peru. Many young people, male and female started to join the Society. They came from all walks of life but met regularly together for continual formation and to organise catechism courses and other meetings within parish setups. Fr Preca, later wrote a Rule for all members, where the SDC way of life was fully outlined. 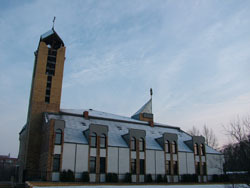 He wanted SDC members to be lay celibate people who commit to work within the Church through teaching and evangelization. In 1952 some members were sent to establish SDC in Australia where many Maltese families were emigrating. More recently new centres were opened in England (1988), Kenya (1989), Albania (1993), Peru (2003), Poland (2010) and Cuba (2011).